EFP’s CRPCS connectors are a material and labor saving device designed to provide vibration and noise isolation when connected between piping and vibrating equipment. These special connectors are intended to facilitate a reduction in pipe size when connecting to mechanical equipment. They are normally installed on the discharge side of HVAC pumps. Since CRPCS connectors incorporate a reduced size flange on one side, it eliminates having to install both a straight flex connector and a pipe reducer. 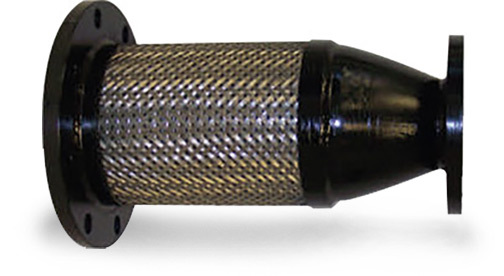 CRPCS connectors utilize series 300 stainless steel hose and braid, carbon steel flanges, and carbon steel bell reducers. Longer length connectors are available on request to provide additional lateral deflection and increased vibration control ef ficiency. EFP also maintains a large inventory of flexible stainless steel connectors in groove x groove, groove x flange, besides the above mentioned reducing styles.